For the 11th time since 1919, a no hitter has been pitched by a player...with the team on the losing end having scored a run. It's the first time it has happened since the 1993 season, when Houston's Darryl Kile fell victim to the harmless occurrence against the New York Mets. Regardless, it still counts for an official "no no", and will be in the record books forever. Today's pitcher of fate, was the Los Angeles Angels of Anaheim's Ervin Santana. Not only was it a great start for the Angels' right hander, but it was his first win against the Indians in 7 career starts against "The Tribe". He is the third American League player, and all around Major Leaguer to pitch a no-hitter this season; The other two, Justin Verlander of the Detroit Tigers, and Francisco Liriano of the Minnesota Twins. His no hitter, was the ninth in the history of the Angels franchise, and first since 1990 when Mark Langston and Mike Witt combined for the rare feat. The cap he wore during today's game, was identical to the one you see above. This season, for the Angels 50th anniversary, the club is wearing multiple fitted caps spanning 162 games, honoring all the eras of Halo's baseball. The cap above, represents the current era spanning 2002 to now. The fitted hat features the typical Angels red color on brim and crown, and the Angels "A" front and center. The differences are the gold halo encircling the "A", and the 50th anniversary patch located on the side. 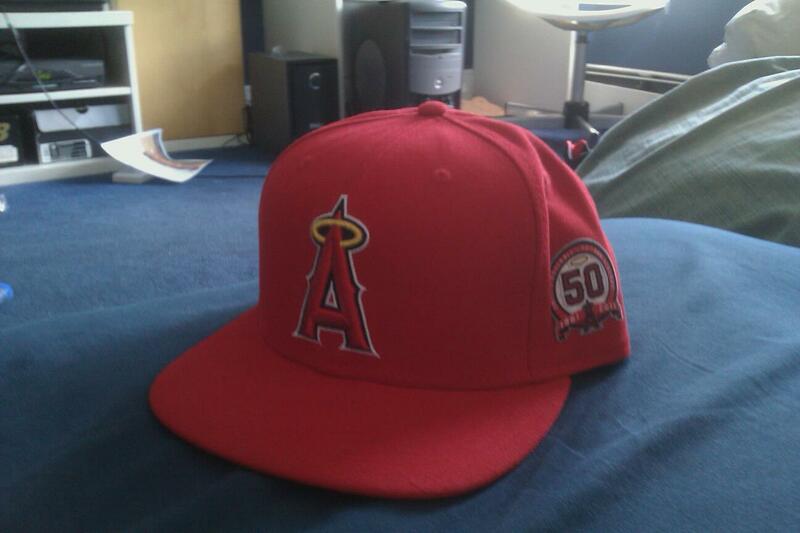 This cap can be found at any of the normal cap outlets, such as Lids, New Era, MLB, etc. To me, this was a must buy cap, due to the classic look it exhibits. Santana, despite having a sub 4 ERA, now only has 6 wins on the season. Maybe this start can serve as a jump-start to the proverbial heart of the Angels organization. With only 57 games left and a record of 57-48, the Angels are only 2.5 games back of the division leading Rangers. Keep an eye on the Angels come Sunday, to see if they make some moves at the trade deadline. A hitter wouldn't be an awful idea, considering their high RBI man is Torii Hunter with a mere 49. Until tomorrow, it's been real folks. Enjoy. Just an average hat. Not the best. Not the worst.